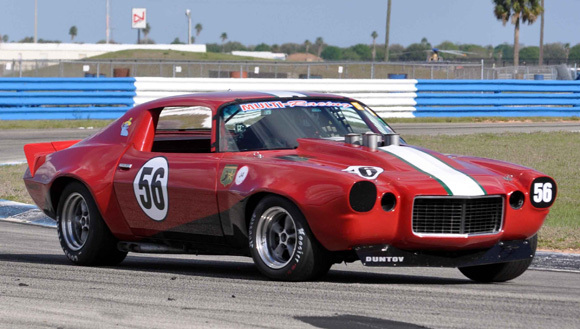 This was SVRA’s inaugural event for 2012, and ours as well. We brought our factory #38 1969 Corvette, Clair’s 1968 roadster and Sam Lecomte’s 1970 Camaro. It turned out that we brought the Group 6 race with us! Edward broke his left hand playing softball a few weeks before the race, so I got a chance to drive the company car. It last ran in September when a broken valve spring ended our big showdown race with Peter Klutt on the out lap at Watkins Glen. That was the last straw with our engine supplier, and we made a change. The new engine traded a bit of power for what we hope will be a lot more endurance! This was our second race weekend running our new Platinum brake pads and our special J56 bridge calipers. We really didn’t get enough track time at Watkins Glen for a proper test, but this weekend would tell if the new set up was worth the considerable price tag. 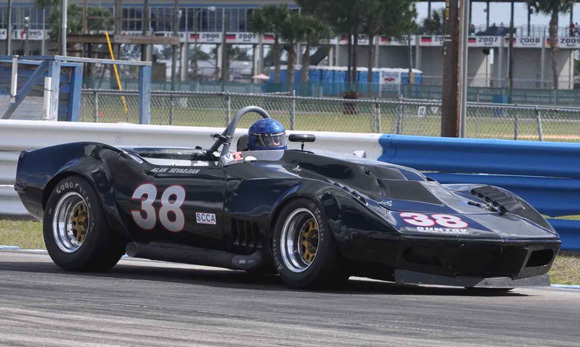 Clair’s last race was the HSR Sebring race in October, and unfortunately it too ended up with an engine related DNF. Clair’s new engine is 460 cubic inches, and it has a lot more power than his old 427. SVRA put Sam’s newly repainted Camaro in Group 6x, which means he runs with the group but he gets no points and no recognition. 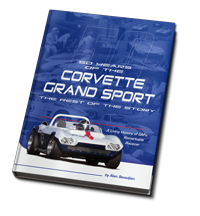 His car is a historic Trans Am car Sam bought from Gene Felton. It is hard to miss, as it has huge fuel injection stacks that stick out of a hole in the hood. With the X designation, you get to participate in the race, but even if you win, you just go back to your trailer, load up and go home. 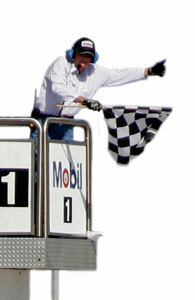 The second place guy would get the top step on the podium. It could be a bit confusing, but there were not that many spectators to get confused, and Sam didn’t win anyway. As a matter of fact, there were more X cars in Group 6 than there were big-block Corvettes, so apparently it is getting quite popular to be X rated! Sam’s fuel injected Camaro is really a rocket ship. Nothing stays with this car going down the straight, and it is no slouch in the turns either. Sam won the Mitty three years ago in this car, and was leading the Sebring HSR Group 5 race in October when an improperly valved shock launched him off the track and into the fence two laps from the end of the race. We revalved Sam’s shocks, and since I was supposed to drive the car in the Sunday enduro, I got a chance to practice in it on Friday. The shock work was a major improvement, and we weren’t surprised when Sam qualified two seconds faster than he had qualified in October. Clair had a really challenging weekend. On Friday he suffered a broken new Eaton carrier, which is the first time we have experienced a failure of that particular part. On Saturday he experienced a broken 4130 spindle, which pitched him off the track and tore up his right rear fender. That is our first failure of that particular part as well! It hardly matters, but the part was covered by the manufacturer’s warranty; a rarity in racing. The #38 car performed well. We had a few issues, but nothing serious. We qualified on the pole and won both races. The margin of victory was 42 seconds in the 8 lap race. Sam led most of both races until his brakes and tires went away. Up until then, every time the #38 car passed him, he came back around when we got on the back straight. It was a blast running with Sam. He is a very good driver and his car is just too damn fast to be a Camaro! The brakes were the difference. We stopped way better and experienced zero brake fade all weekend. I constantly found myself having to accelerate to the apex after I slowed down too much, even though I had driven in way deeper than I ever had before! Wait until Edward gets a chance to wring out these brakes! The 38 car under braking; the very best!